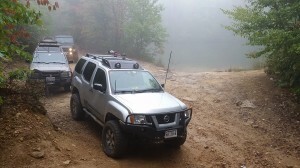 Taskers Gap/Peters Mill/Winery | Capital Off Road Enthusiasts, Inc. Shortly before the weekend I realized I would be available for some 4×4 fun in the coming days and so I put out a call for others that may be interested in a short notice trip to Taskers Gap/Peters Mill and a winery. Shelley and Alana met at my house where we hoped in the Xterra to head to our first meeting point. There we met up with Mike and Mark and continued on our way to Edinburg. 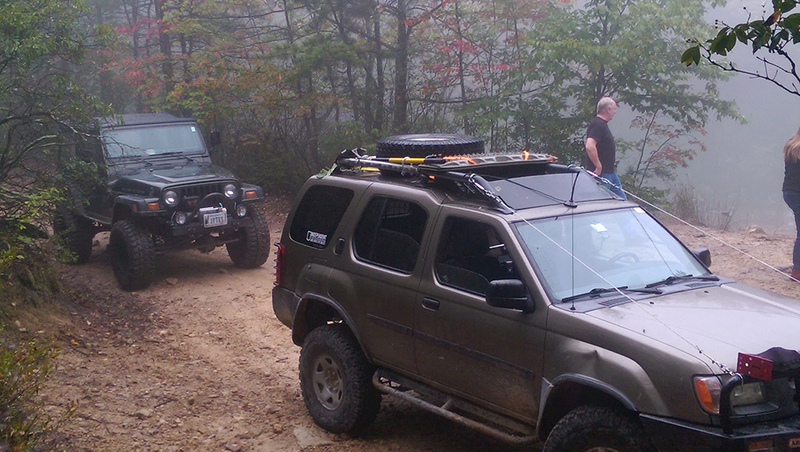 We stopped at the gas station to top off, grab food and get our permits for the trails. Mark offered to let Shelley or Alana ride with him since we had 3 in my vehicle and he had an available front seat. Alana took him up on the offer. 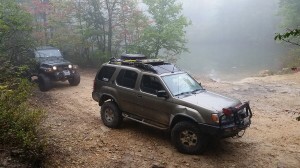 Off we went toward the cool fog covered mountain! 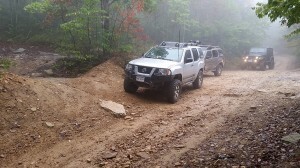 We headed up the mountain on Edinburg Gap Road and into a thick fog. We passed the entrance for Peters Mill Run and continued back down the mountain a little bit to the beginning of Taskers Gap OHV road. We pulled off the pavement and when we got to the clearing at the head of the trail we stopped to air down, just for comfort really. This trail was new to several of the folks in the group so we just enjoyed the ride and the woods, stopping for the occasional hawk or other critters as we spooked them in the woods. 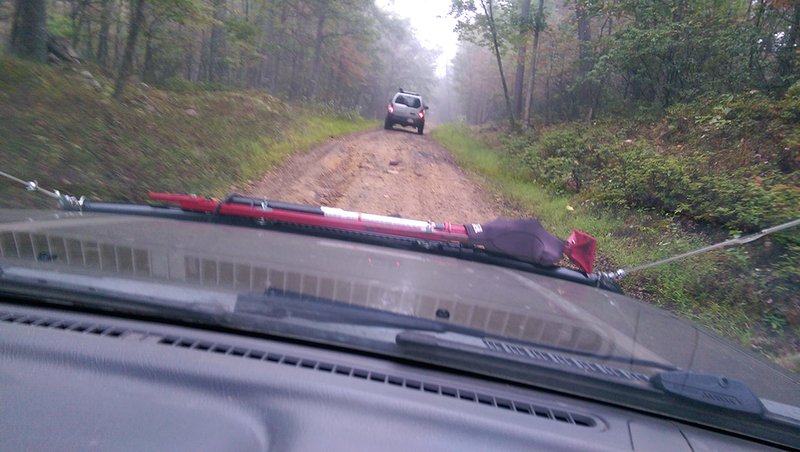 Mike said it best over the CB when he said “I like this trail, it’s nice to get out with no fear of breaking my truck!” The trail was easy but had some mildly flexy spots and thick red mud at the end where we turned around. After getting off the trail we headed back up into the thicker fog to the Peters Mills OHV parking lot and stopped for lunch. A few enjoyed the bathroom facilities but mostly we just hung out and ate our packed lunches. Once everyone was satiated we packed back in and headed across the street to Peters Mill. The fog was so thick you could hardly see 50 feet in front of yourself sometimes, and the trail was so wet. 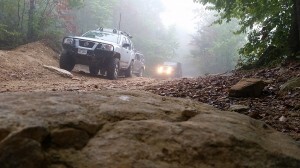 However it was in good shape and we were surprised to find even the small rocky hill that can present a challenge to some seemed devoid of its cantaloupe sized rocks, making for a few disappointed drivers. We continued on finding the trail overgrown in spots so that the brush was closing in on both sides of the vehicle. We occasionally ran into others on dirt bikes but other than that we basically seemed to have the mountain to ourselves. Eventually we made it to the other end. We aired back up and Mike decided to call it a day (something about jet lag or something). 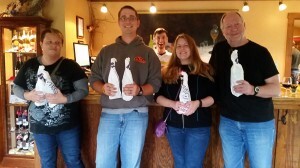 Off the remaining 4 of us went to North Mountain Vineyard and Winery in Maurertown, VA.
We got there a little after 4 with plenty of time to enjoy their offerings until they closed at 5. The wine tasting was only $1/wine, so with 7 wines to try we all paid up and saw what they had. Each of us found something that we liked, and ended up with a bottle or two each to take home. After a drive back to Herndon we parted ways. Thanks again to all those that participated, especially on such short notice. It was a great excuse to just get away from town for the day and head out into the woods! Trip report courtesy of Andrew Taylor. Pictures courtesy of Shelley Fitch, Andrew Taylor, Mark Wilson, and Mike O’Grady.